Due to the Broadmarsh car park and rebuild there following long term lane closures are in operation: Collin Street Middle Hill Carrington Street Canal St These lane closures will stay in place for the majority of the demolition and rebuild of the car park. 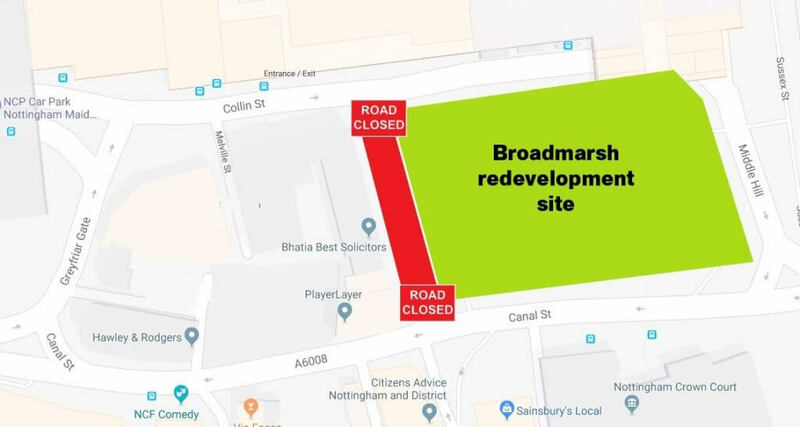 From Monday 15 April Carrington Street will be permanently closed from Canal Street to Collin Street as part of the Broadmarsh redevelopment works. Buses will divert via Canal Street/Greyfriar Gate/Collin Street. These lane closures will stay in place for the majority of the demolition and rebuild of the car park. Taking decisions that will in the short-term create disruption for motorists is not easy or popular. But bold, long term action is needed if we want to make sure Nottingham continues to thrive well into the future – a future where our investment in a top-class public transport system will be increasingly important.